Set up a Text-to-Join keyword to collect contacts by text message! 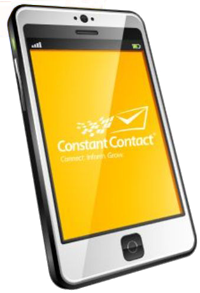 Constant Contact’s Text-to-Join is a free tool to help contacts join your mailing list by text message – no computer required! Set up a free text messaging keyword and promote it at your events or place of business. Your keyword will work on most U.S. phone carriers and is only available in the U.S.
A contact sends a text message to your keyword. Your keyword sends a reply back, asking for the contact’s email address. The contact replies with an email address and is saved to your chosen contact list. Your keyword sends back a thank-you message to your new contact. With text messaging so popular these days, it’s a quick and easy way to build your list of contacts.